Sitting on the hills right outside Newberg, Oregon Dream Ponies offers visitors a chance to have their kids experience horses, in a low-key and educational environment. Horseback riding and living in the country was a life-long dream of Kim Taylor, better known as “Cowgirl Kim” on the farm. Taylor and her husband Bob, known as “Cowboy Bob,” purchased the Taylor’s Hillside Farm, a 5-acre property and started plans for the business. The property is beautiful, surrounded by organic Rex Hill wine fields, which makes it the perfect place to enjoy the wine country around Newberg, while at the same time giving you children a chance to learn about horses and ponies. The indoor arena has a wonderful backdrop no matter where you look, with wine fields on two sides and a view down onto the Willamette Valley on the other. The Taylors work hard to make sure their farm is more than just a pony ride that you can get at a carnival or a roadside attraction. Not only does Taylor have seven small ponies, which can carry up to 65-pounds, but also ducks, dogs, chickens and a cat. The couple is also cultivating Christmas trees on the property, and plan to have a lot when they are mature. The experience is an intimate one, without the hustle-and-bustle of riding a pony at a carnival. 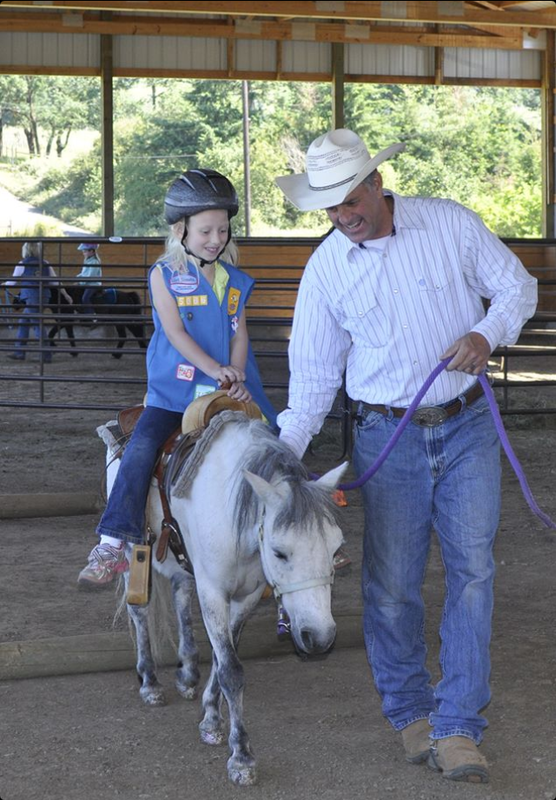 Your child gets to experience the pony and understand how things work, learn about safety, and really feel like they got a lesson, instead of just a random ride. The couple offer everything from birthday parties with the ponies, to farm tours, pony ride experiences and even a decorating experience where children to help decorate the pony. But don’t worry, boys aren’t left out – there is Bob the Pony, who sports a red, white and blue ribbon. Taylor said she worked hard to find the right ponies, and any tricks they know, she spent the time to teach them. Taylor also takes the ponies off the farm for farmers markets and other experiences, mostly to promote her farm. However, as a former teacher, she also visits local schools with the ponies. “For us it’s about sharing the experience and teaching kids about animals and living in the country,” she said. About Oregon Dream Ponies: Oregon Dream Ponies is a 5-acre farm near Newberg, Oregon that caters to giving people their first experience with horses and ponies. Focused mostly on children, they offer pony rides with a plus – an educational experience about the animals and how to act around them safely. What to bring: The arena at Taylor Hills Farms where Oregon Dream Ponies is located is covered, but open-air. So make sure to layer yourself and your kids in case the Oregon weather takes a turn. Also, bring you camera and even a lunch, and enjoy the scenery and eat on the picnic tables provided. Tip: Booking your trip in advance is a must, as during the summer there is a wait to get to see the ponies. This isn’t a roadside attraction, so an appointment is necessary and you can schedule a time through phone or email. Season: The farm is open year-round. Getting there: The farm is located along a gravel road at 16725 NE Hillside Drive, Newberg, OR 97132. It is about 15 minutes from Highway 99W.